Men’s and Women’s Championship competitions during the summer season are held mainly on the weekends. 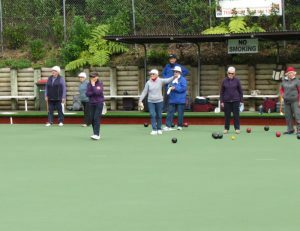 The Club is always well represented in Auckland Centre and National bowling events where members have achieved outstanding success. In the Saturday Interclub the Club usually fields four Men’s teams and two Women’s teams. Club teams also participate in the National Interclub competition. When entries are sought they are notified on the whiteboard in the hall. Conditions of play are also posted on the notice board. Team selections are also posted on the notice board. Every opportunity is given to new members to be included in the selection of interclub teams. When entries are sought they are notified on the Tournament whiteboard in the lounge. As these are single day events the number of entries are limited by the number of available rinks, with entries accepted on a first come, first served basis. Players looking for a team may enter their names in the ‘Single Entry’ list and enter a team when one has been organised. The Tournament Manager may help facilitate team formation. When entries are full, teams and individuals may enter their names on the reserve list. Results are decided by wins, ends, points, & points differential. Club competitions are all one day events of 3 games of 1 hr 15 minutes. The dress code is Club colours (navy and white) or whites. Competitions that are not pathways to Auckland Centre or National competitions may be combined competitions. Our Carpet green gives us the opportunity to play over the winter months. A Men’s Open Triples tournament is held Wednesday each week with an Open any combination Triples tournament also weekly on Fridays and Sundays. To cater for the more Social bowlers a Roll-up is run each Saturday afternoon. We welcome anyone to come and ‘have a go’ at playing bowls. Bowls of different sizes are available and all you need is to wear a pair of flat soled shoes. Please call the Club on 626 6450 to make arrangements fora convenient time. § Alter or amend the programme as considered necessary or desirable due to unfavourable weather or other adverse conditions. § Vary any of the conditions of the programme. § Temporarily suspend or abandon any game. § Entries close at 5pm on the day prior to play. § Club only events are notified on the whiteboard in the hall. § Open tournaments are notified on the whiteboard in the lounge.